A few weeks ago I headed up to Lassen Volcanic National Park to photograph a family of Water Ouzels that one of our Audubon members sighted near the visitor center there at Manzanita Lake. Since it’s only about an hour drive for me, I like to go up and scout the area for rare and nesting birds before our annual Audubon Camp Out and the timing was perfect. The Water Ouzel (American Dipper) family was easily found and after spending some real quality time with them I continued hiking the trail around Manzanita Lake where I met a couple who were visiting from Pennsylvania. They told me the story of some Brown Creepers (Certhia americana) that they encountered just up the road at Summit Lake. The way they told the story, from the parking lot at the beginning of the trail around Summit Lake, they walked a short distance where Brown Creepers were hopping around on the tree trunks, squawking at them and practically landing on them! Well, I thought, they must have a nest there because I have not known Brown Creepers to be anything but inconspicuous and distant, climbing up tree trunks, well camouflaged, giving but a glimpse to the ever vigilant birder. Obviously, I wasn’t going to pass up this opportunity! I had only found one other Brown Creeper nest before and it was just last year at Manzanita Lake. I made my way up to Summit Lake and followed Steve and Sally’s directions to the location of their encounter with the creepers. Probably less than a hundred feet from where folks were eating at the lake’s picnic tables I got my first glimpse at one of the Brown Creepers climbing up the side of a tree with some sort of winged insect in its beak. As I began photographing that bird, I heard the high pitched squeaking of another creeper right behind me. This incredible photo session, with (what I later figured out were only) two Brown Creepers hopping from tree to tree and vocalizing before heading away to forage, only to return a few minutes later to repeat the same frenzied behavior, was caused by me standing to close to their well hidden nest site. This behavior also included something I had never seen before, the Brown Creeper perching. Once I realized where the nest was and backed off several feet, the two parent birds returned to their normal behavior of foraging for insects and bringing them to the nest to feed the nestlings inside. This is a photo of one of the adults at the hidden entrance to the nest. Once the food is delivered to the nestlings, the adult exits via that slit in the bark on the opposite side of the nest from the entrance. You can see pine needles and other nesting material sticking out of the crevice at the bottom of the photo. Once the adults were back to their normal behavior of feeding the nestlings, I worked my way around to the side of the tree where I could see into the cavity entrance, remaining a safe distance from the nest to film this video. You can hear their high pitched squeaky call, especially at the beginning of the video. Brown Creepers are certainly spunky little bundles of energy! Wonderful footage, Larry. I’ve been trying (unsuccessfully) to get similar material for years. Kind of hard when you live in Florida. Wonderfl photos Larry and what a clever nest site with multiple entrances. The only giveaway to the nest are the few twigs sticking out from under the bark. Congratulations on your takes, I probably would not even have been able to spot those little fellows. Great pictures, I’d never thought about perching Brown Creepers! @Steve that’s gotta be tough alright! Certhia-creepers are very common in Germany (we have two species), and I’ve seen thousands and thousands of them, and found quite a few nests. But I have never even seen them perched! That is absolutely amazing!! He there – great shots of the treecreeper – we have similar named birds here, but they are not closely related. Very cool to see your photos of the nest! 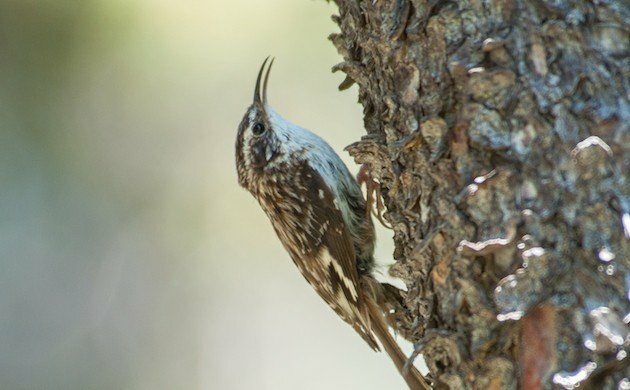 It’s always fun to spot a Brown Creeper, and your photos show how beautifully camouflaged they are! Thanks for a great post! Incredibly beautiful pictures you show.